... then you find your brilliant idea on the shelves in Wal-Mart? 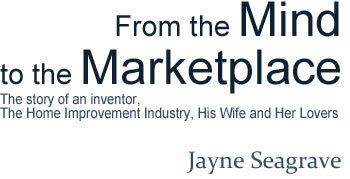 While the road from the mind to the marketplace is frustrating and far from easy, Jayne Seagrave’s highly entertaining book, From the Mind to the Marketplace: The Story of an Inventor, The Home Improvement Industry, His Wife and Her Lovers, sets out how to succeed in taking a new idea to market, how to expand those markets, and how to effectively run a new business. With over 90 percent of businesses in Canada being small businesses, this book provides exceptional insights into what it takes to establish and succeed in this growing arena. JAYNE SEAGRAVE was born in England and moved to Canada in 1991. She has a Ph.D. in Criminology and is an international best-selling author. Besides academic texts on policing, she has published travel and camping guidebooks. 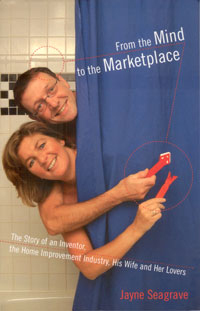 In conjunction with her husband Andrew, she has owned and managed the Vancouver Tool Corporation since 1996. Jayne lives in Vancouver with Andrew and sons Jack and Sam.